Sewer & Drain Cleaning – Tischbein Co. Inc.
Sewer Backup, Buried Downspout Line, or Clogged Drain? We have you covered! We Find & Fix Them All! Don’t be lured by sales gimmicks or a “special of the week” from large plumbing companies offering quick and inexpensive “drain opening” services. These offerings are often incomplete and only produce a temporary fix. 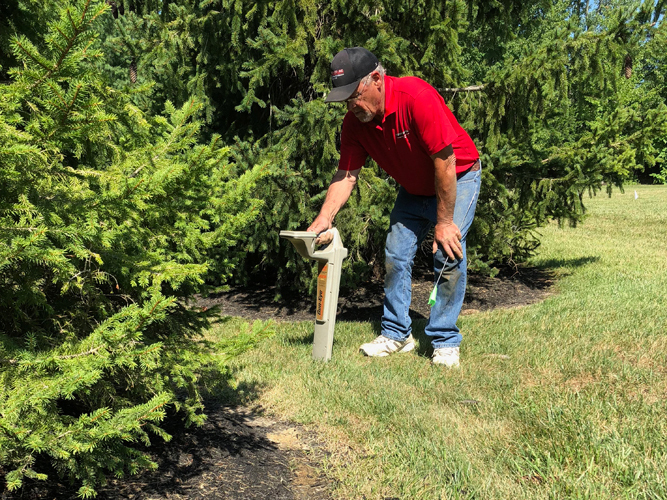 The Tischbein Co. provides a complete pipe cleaning service that includes hydro jetting and/or root augering, as well as a thorough video inspection of your sewer line, downspouts, or drain lines. Cleaning a pipe, in conjunction with a video camera inspection, is the most effective and only way to accurately target each problem area. We can also locate and mark, above ground, any section of the underground pipe including the depth, direction, and length of the pipe. We also offer a detailed video inspection report upon request. 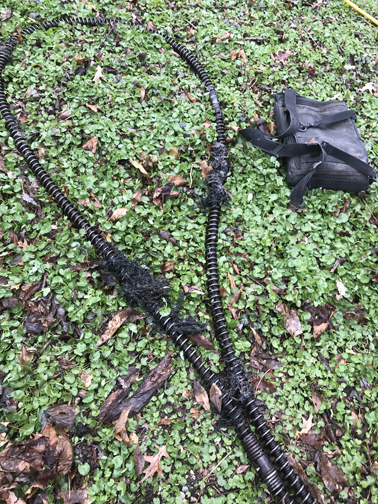 In many cases your clogged line can be hydro jetted and flowing properly within a few hours along with recommendations and options for a permanent solution. Don’t settle for a cheap ineffective service call, choose the Tischbein Co. to find them and fix them all. 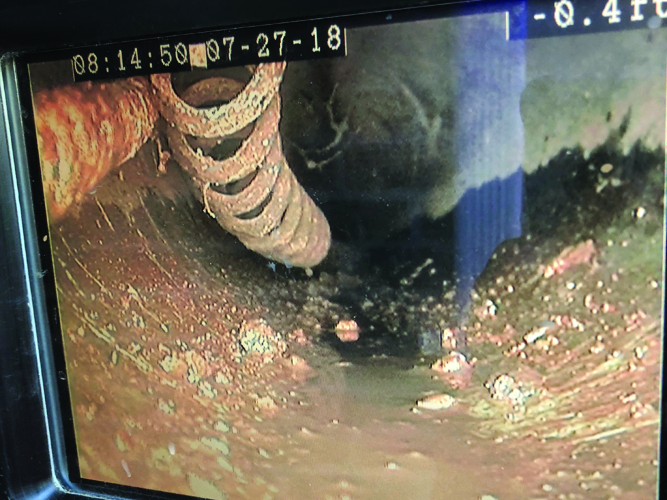 A video inspection is performed with a unique type of camera that can be pushed through a pipe. 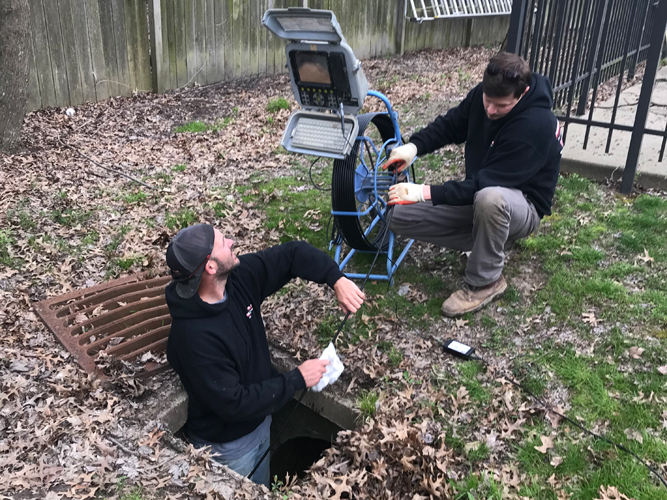 This can reveal a lot of problems in a buried pipe, and also gives us the ability to locate exactly where the problem areas are. This will eliminate guess work, unnecessary digging, and costly repairs. 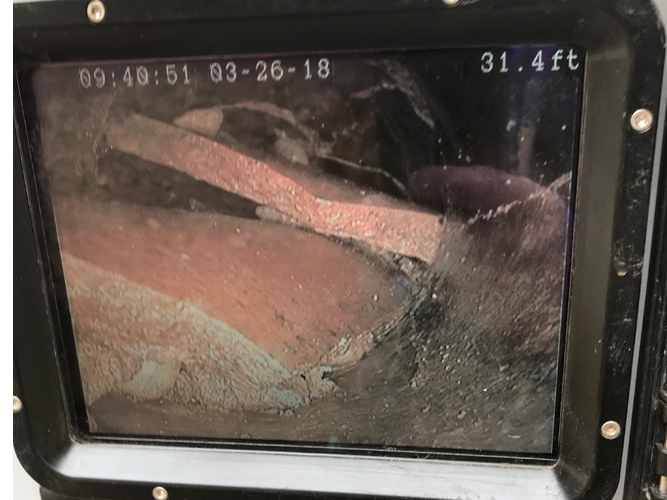 The photos below show a broken auger that was left behind in the pipe, pieces of a broken pipe, a video inspection of a storm drain, our locating device finding an underground pipe, and a video clip of the camera going through a drainage pipe. 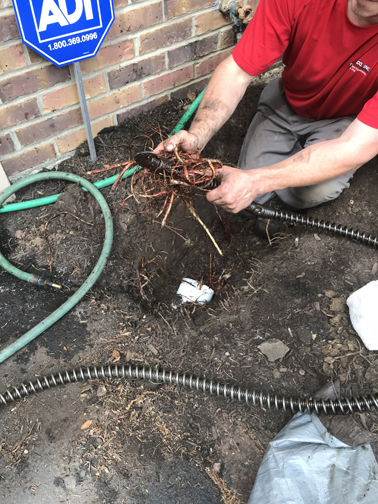 Hydro Jetting utilizes a hose, a specialized nozzle, and pressurized water to cut through roots and debris clogging the line, while simultaneously flushing and cleaning the pipe. This process is performed through an access point called a clean out, found on the vertical pipe stack or on the floor. Hydro Jetting is the most thorough and efficient way to clean a pipe. The photos in the slide to the right and video clips below show our Hydro Jetting equipment, a before and after view of root clogs cut out by the specialized nozzle, and some video clips of the nozzle and Hydro Jet in action! A drain auger or drain snake is a coiled metal cable and a variety of root cutting attachments used to unclog pipes. It spins rapidly as it moves through the pipe catching and cutting the roots that are clogging the pipe. Pipe Augers are good for quickly penetrating through a section of the blockage to allow the water that has backed up to drain. 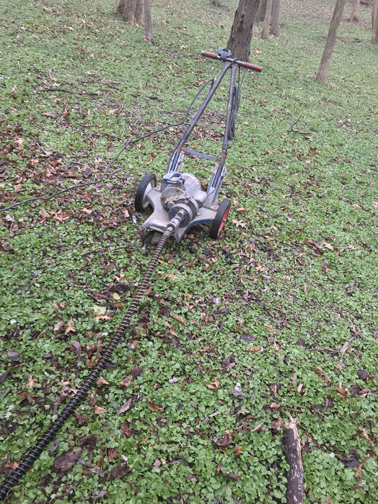 We use an electric motorized auger machine when hydro jetting is not an option or when it is necessary to initiate the cleaning process in conjunction with the hydro jet. However, this method of pipe cleaning is only temporary, and the results are limited based on specific conditions. The photos below show the auger machine we use and cables with roots cut and pulled back out of the pipe. We all know the importance of having a complete home inspection before purchasing a new home. Unfortunately, this does not include an inspection of the underground pipes. Have a true and complete inspection of your potential new home. Be sure to include a video camera inspection of the sewer and downspout lines to check for roots, blockages, and breaks. A clogged or damaged pipe will force sewage and/or storm water back up through the pipe because it can no longer flow in the proper direction. Without an inspection of underground pipes, you won’t know if there is a problem until it is too late. It will leave a serious mess, end up costing thousands of dollars to repair, and will certainly ruin the pleasure of moving into a new home.